If you read many other threads here (or play more games), you'll find you're right. A lot of Viticulture is making good use of the Visitor cards, and more importantly, adjusting your strategy based on the cards that you pick up (of all four types). 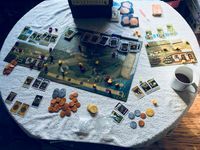 Yes, that does add a significant element of randomness to the game, and if you don't like that in your worker placement games, then maybe Viticulture isn't for you. I quite enjoy the challenge of working with what my Mama and Papa give me, and then seeing if I can make use of the visitor cards I draw, and discarding the ones that are no good to me. (Building the Cottage early is good, because then you're gaining two new Visitor cards each round). Adding in the small "Moor Visitors" expansion is good because it gives you, unsurprisingly, more visitors. Yes money is tight but important in the early game. And readily available but not needed late in the game. Personally, I find this adds to the theme. You have inherited a run down vineyard so it needs lots of work and you don't have much money. Once you get it back on its feet, it will make money for you as a working concern, and while you will have some ongoing costs, most of the big ticket items will be behind you. Perhaps some sort of mortgage mechanic would have worked here, but then it would have been a very different game and I very much like the game as is. I do have other thematic concerns though. Grapes left on the crush pad improve with age? Sorry Jamey, they rot and go mouldy and need to be thrown out. You can mix any two reds and a white to get a sparkling wine? Sorry Jamey. I drink sparkling Shiraz. and - you guessed it - it is made from only red grapes. And my favourite white bubbles is made from Chenin Blanc. Again only one sort of grape - white this time. Still they make game sense so I don't mind too much. A while back though there was a real winemaker on here who said they couldn't play the game because of the errors in theme so perhaps it is best if you don't know too much about the industry. Tuscany. Add it. You won't look back. It helps enormously with the swingy nature of the card draw. It will no longer be an issue of you only draw white grapes and red orders. Yes it happens. The revised turn order system works really well; and the full use of seasons adds to the theme. Viticulture is a race. If you have leftover money, you weren't as efficient as you could be. Tuscany changes the game so much that IMO you don't have an improved Viticulture but a completely new game. We play both with and without Tuscany all the time and it really feels different enough. Totally agree with everything you said. The winemaker thing is pretty funny. Indeed, Tuscany definitely gives you more things to do with money; more structures to build plus you can trade money for points if you have an excess.